Manhattan: Comfortable, Large, Open Tour Boat for the Canals. 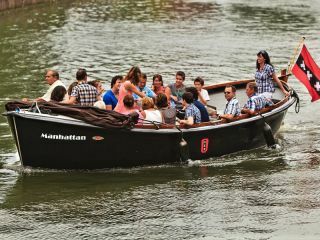 After a life as a rescue boat on a cruise ship, the Manhattan started a second life as a private tour boat in Amsterdam. Completely refurbished, it can take up to 24 people on an open air tour on the canals. It is equipped with an electric engine, lounge pillows and large cooling box. Catering can be arranged. This boat has no toilet.